You'll love this photo gallery that displays pictures of landscape quilts and other types of art quilts made by members of the online quilting community. Some of the quilts in the photo gallery are made from patchwork, but many of the designs are created using applique, thread painting, embroidery, and other techniques. Many landscape and art quilters used hand-dyed fabrics and fabric painting techniques to translate their ideas to cloth. There's no limit to the methods you can use to create an art quilt. If you're beginning your first art quilt, try using a simple color wheel and learn how color value affects the ways that fabrics contrast or blend together. From Joy: One Rose is a little quilt that measures 7.5 inches by 12.5 inches and is made from cotton fabrics and cotton batting. The quilt is pieced and appliquéd with piping, all done by machine. This Art Quilt was inspired by the book The Rose Rent, by Ellis Peters. Alaffin created this quilt from a photo of the Three Sisters Mountains in Central Oregon and added a bit of imagination toward the front. The landscape quilt measures about 24 inches by 36 inches and was donated to a charity auction. From Joy: Grow Already! is an art quilt designed and constructed by Joy. The quilt is based on the Chronicles of Narnia books by C.S. Lewis. It measures 30 inches by 30 inches and made from all cotton fabrics, cotton batting, and glass beading. Alaffin designed this quilt using a photo taken in the Tualatin Valley. It depicts a walkway around the Jackson Bottoms Wetlands in Hillsboro, Oregon. Lizzyquilts created her quilt in the bargello style and, after piecing the background, realized that it looked like a sunset. The look inspired her to add Kokopelli and other themed motifs to the quilt. Dona made this raw edged applique quilt for one of her daughters. Pirates Cove is Inell's first landscape quilt and was made for her quilt guild's annual challenge. She started with the schooner ship that's visible on the water and built the design around that theme. The quilt includes embroidery, along with shell and coconut embellishments. From Joyce: This quilt was in my head for years before I had the time to actually design it. The hand-dyed fabric is by Judy Robertson and was used for the sky–her fabric was actually the inspiration for the design. Many techniques were used in this quilt, including raw edge applique, extensive free-motion machine embroidery, overlays of tulle for filtered sunlight, and coloring with Tsukineko inks and wax pastels. The piece was machine quilted. From LilyBee: This miniature landscape quilt was made during a 2010 Quilt University class with instructor Susan Brittingham. The quilt was based on her class model. From Pat: I had to base my art quilt on a famous painting, so I chose one by Don Quinquela Martin, a great self-made artist who lived in Buenos Aires (born 1890, died 1977). His paintings showed the docks by the Riachuelo (a branch of the River Plate) packed with boats that were never at sail. The quilt measures 47 centimeters x 46 centimeters. It was created with machine appliquè and machine embroidery. From Joy: This little quilt measures only 8 inches by 10 inches. It is made from cotton fabrics, cotton batting, and glass beads. The quilt was inspired by the Tacky the Penguin series of children's books. The weaving represents the stiff penguin world of those around him and the bright coat and beading both signify the carefree way that Tacky lives. Kathy says: Natural Wonders is a 60-inch bu 63-inch landscape quilt made in 2010. The quilt is all about the simple magic of discovery. One-hundred-three different fabrics were hand appliqued together to create the seascape. For now, the destination only exists in my mind, but I expect to find it someday. Techniques used include hand applique, hand embroidery, 3D Yo yo embellishments, and machine quilting. Diane says: It Takes a Village is a 14-inch square quilt made during a quilt guild challenge for a storefront design. I chose my sister Patsy as the subject–she is a watercolor artist and does art classes on the lawn of her house during the summer. I gave the quilt to her for her birthday. Pat says: I made this quilt after a photo taken by Carlos Alberto Bau, a great photographer who died in a plane crash at the beginning of 2010. The picture depicts a frozen lake and the Andes in the south of Patagonia. The sky is red because I assume it was at dusk. I used machine appliqué and machine free hand quilting to make the quilt. It measures about 7 3/4 inches by 7 3/4 inches. 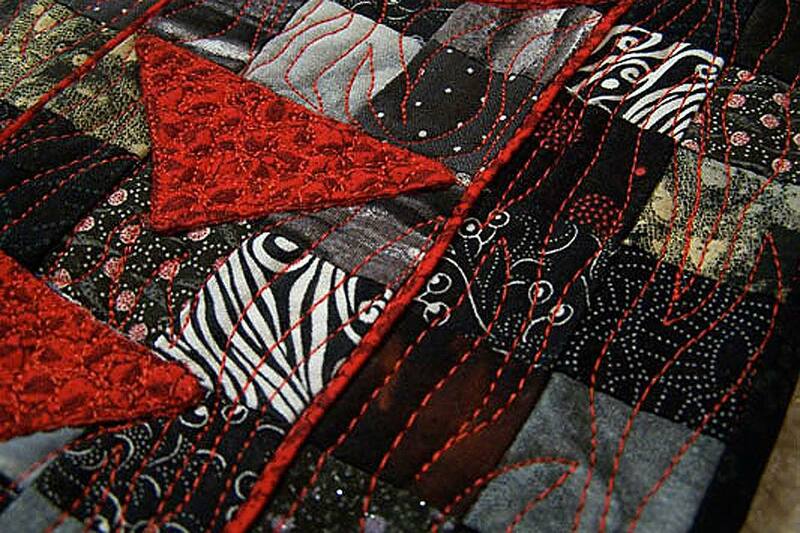 From Sally: I took a class from Ricky Tims in 2008 and learned how to design my own Rhapsody quilt. Rhapsody Meets the Southwest was the result. I live in Arizona and I am an archaeologist who loves rock art. From Annie: I love this story and thought it had some cute characters that would display well in a quilt. I chose something from each chapter to applique into a block. It uses needleturn applique, hand embroidery, and hand quilting. The quilt measures 76 inches by 84 inches. From Nancy: This 22-inch-by-21-inch wallhanging was inspired by the fabric in it, which was a scrap from another project. When I saw the orange/yellow batik, it immediately said to me "sunset." I drew the tree freehand, cut it out and appliqued it in place. The "sky" and the "grass" were quilted quite densely to add dimension. From the Quiltmaker: This is a wallhanging created in a class by the designer, Susan Loland of Black Eyed Susan Designs, who visited us in the Fall of 2009. We used Batiks in the class, and white and burgundy flowers were embellished with thread painting. This was my first time using this technique and I was very pleased with it. The quilt measures 26 inches by 33 inches. From Downsouth: The photography of David Lorenz Winston has always inspired me, as I love nature, especially trees. After getting Mr. Winston's permission to copy his photography into a fabric landscape quilt. Looking back, there are things I would do differently now, but I assume a lot of us feel that way after a project is complete. The quilt measures approximately 34 inches by 39 inches. from a June Jaeger Workshop, Quilt by Kathie S.
From Kathie: Nature's Sampler is a landscape quilt inspired by a class taught by June Jaeger. I finished the quilt after a few months. I enjoyed making the quilt and learned how to do machine applique using fusible web. The quilt measures 72 inches by 77 inches. From Linda: Desert Etchings is a quilt inspired by the petroglyphs of the southwest, and was made using a combination of machine appliqué, half square triangles, and straight piecing. Set on point, the images of ancient American Indian petroglyph art are set off by a colorful sashing and then surrounded by a rain cloud border. The quilt measures 54.5 inches by 68.5 inches. From Claire: This is a raw edged applique wall hanging that was inspired by a calendar of New Zealand scenery. The original picture had reflections, which were a bit beyond my capabilities, so I changed the bottom half of the image. Pieces were put on with a glue stick and when the picture was completed all edges were secured with a straight stitch in matching colors. Quilting anchors the larger areas. The quilt measures 25 inches by 26 inches. From Clothscape: This quilt is based on a photo I took in the Warrumbungle National Park, near where I grew up in Australia. Grass trees, sort of a cross between a palm and a fern, are pretty common in the area. This was one of my first experiments with this style of applique. From livanachat: I made this quilt using the block wonder pattern, combining a few colors with butterflies because I wanted a very quiet wallhanging. I added grasses over the quilt with fusible web and will topstitch them and add beaded stars when I have time. The quilt measures 45 inches by 40 inches. From Marion: I made this quilt not long after discovering the tree quilts by Ruth McDowell though it's nowhere near as complex or neatly made. The tree was appliqued onto the pieced background, then quilted, all by machine. The quilt measures about 1 by 1.5 meters. From Nettie: This quilt originated from a photo taken by my uncle. From that I made a pattern. This was my first attempt at a landscape quilt. From Wendy: This is a quilt I made for a juried art show in Cortez, Colorado. I enjoy making sunflowers, and this was my second time around with this design. It looks totally different from my first sunflower quilt. From Wendy: I made this quilt for a juried art show at our local Cultural Center in Cortez, Colorado. From Toni: This quilt was inspired by the water gardens in Balboa Park, San Diego. We used to visit them when we were young and lived there. My brother and his wife still live there and when their daughter was born I designed this for Isabella. It measures about 50 inches by 60 inches. From Kelly: This fabulous art piece was made especially for the 6th Annual Black Swamp Benefit Bazaar. Measuring 97 inches by 116 inches, the quilt was designed by Kathie McClarren, owner of Corner Quilts in Wauseon, with assistance from Mary Clark of Sylvania, Ohio. The background was pieced by Carolyn Snyder of Pettisville, Ohio. The 2007 feature quilt was hand quilted at Zion Mennonite Church in Archbold, Ohio by community volunteers. The quilt is a multi-media piece featuring appliqué, embroidery, hand quilting, and some machine quilting. More than 17 animals and birds native to northwest Ohio are represented on the quilt, including a pheasant, blue heron crane, cardinals, bluebirds, hummingbirds, red wing blackbirds, gray squirrel, and frogs. It was sold at public auction on June 16, 2007, at the Fulton County Fairgrounds in Wauseon to benefit Sunshine Inc. of Northwest Ohio and Mennonite Central Committee. From Teresa: Hafa Adai is a greeting in Chamorro, the language of Guam. The island is filled with naturally growing hibiscus bushes of all colors. This quilt was dye painted and thread embellished. From Shirley: This quilt is 35 inches by 47 inches–it is an original of a scene outside of Cochrane, Alberta. I have lived in this area all my life and love doing art quilts of the area. The quilt includes hand dyed fabric, rough-edged applique, and thread painting. It is machine quilted." From Shirley: This is a southwestern themed original quilt inspired by the nine years we wintered in Arizona. The quilt measures 47 inches by 47 inches and was made from my own hand dyed fabric. Techniques used include rough-edged applique and thread painting. The mountains, sky, and clothing were hand painted. From Shirley: The fairies in this 24-inch-by-24-inch quilt were thread painted and the flowers were appliqued. From Shirley: I donated this landscape quilt to a breast cancer support project. From Shirley: This is an original quilt made for a friend in Washington state. I used my own thread painted fabric. I painted the sky, some of the fir trees and the buildings. The trees are appliqued. I thread painted fir trees over the painting and did lots of additional thread painting on the rest of the quilt. The quilt measures 25 inches by 39 inches and is machine quilted. From Reggirl: This is a single bed size quilt that I made in 12 days before my oldest daughter's twenty-first birthday, which happened to be two days after Christmas, 2006. I hand painted the background and appliqued the black wolf and foreground. Where the colors change, I changed the embroidery thread. There are 15 different colors used throughout the quilt. I created an embroidered Celtic design on the blue outside border. The inspiration for this quilt was my daughter's love of wolves and Celtic designs. I enjoyed making the quilt but would have enjoyed having a bit more time to complete it.